Mice are common Southern California household pests. 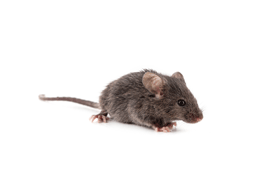 We perform mouse control services in houses (house mouse control), offices (mouse control services for businesses), apartment buildings (mouse control services for multi-family dwellings), open fields and agricultural areas. Mice can squeeze through openings as small as a nickel to enter your home or office building, where they can breed year-round, with female mice having up to ten litters a year of 5-6 mice each. How Do I Know I Need Mouse Control? If you are hearing scurrying sounds in your attic or walls, particularly at night, or if you start to see rice grain sized droppings, you have a mouse infestation and need to schedule mouse control services right away. Mice contaminate the food in your home because they urinate and defecate where they eat. Mice can cause damage throughout your home, gnawing on furniture and household objects. Mouse infestations have been linked to respiratory illnesses, including the Hantavirus. Mouse control services from Knockout Pest Control eliminate your mouse infestation and can help you prevent mice from getting into your space in the future. Mice feed, gather food and bring it back to the nest so the female mice can remain in the nest and produce more litters. Because the gestating female mice do not wander around the house with the other mice, snap traps and glue boards alone might not be a sufficient mouse control tactic. Proper mouse control is a short process; it usually takes less than a month, but the duration can vary depending on how severe your mouse infestation is. Over the course of the mouse control service period, a Knockout Pest Control technician will come to your home weekly to monitor the mouse control traps and bait that they have set. Exclusion and prevention are important to keep mice out of your space over time. Exclusion is one of the most important mouse control steps you can take. Exclusion eliminates the places mice can enter, which ultimately can eliminate your mouse problem. We recommend that you keep areas clear and de-cluttered. We plug up any openings, even the smallest, in foundations, fences and doorways. We stand by our mouse exclusion services so much that they are covered under warranty. The next step for keeping mice out of the house is the strategic placement of traps in your home or office. Finally, our technicians sanitize and deodorize your home to restore your home after a mouse infestation. In cases of severe mouse infestations, it may be required to remove attic insulation because of droppings, urine saturation and mouse nest materials contained in the insulation. If insulation is not replaced, it can cause odors and create an unsanitary environment. As part of our insulation removal services, our technicians remove and dispose of insulation affected by mouse infestation, clean up droppings, sanitize, deodorize, and install new insulation.